It’s important to protect your commercial property. What can you benefit from, louvers, a CCTV system, or more? Keeping your commercial property safe and secure is among the top priorities of a commercial property owner. Your livelihood can depend on your commercial property, so in the awful case that something happens to it, it could be detrimental to your wellbeing. Protecting your commercial property is not easy and certainly not cheap, but securing your investment is obviously important for you and anyone else involved with your commercial property. That is why protecting your commercial property is one of the most important things you can do to thrive, so make sure you take all the proper measures to secure and protect your commercial property. To start off, make sure your commercial property is secure by restricting the manners of access onto the premises. This can best be done by focusing on the entrances and exits to your commercial property. The amount of entrances and exits you have should be limited, the fewer the better because it will be harder for unwanted access to be granted to intruders. Additionally, the doors to these entrances should be made of some kind of heavy, secure material so that no one will be able to break down the doors and break in. Louvers are also a useful way to limit access onto your property, as they are an additional layer of security to your days, but we can get to that more later. One of the best ways to protect your commercial property is by adding security lights, cameras, and an alarm system. Motion detector lights can make would-be robbers feel safe as they attempt to steal from you, but a sudden flash of light will scare them away and make them feel twice. Well placed security cameras can also prove to be useful because when they are visible outside and inside your commercial property, people will know they need to think twice before crossing you, or risk being caught in the act by the cameras. Meanwhile, when all else fails, an alarm system can be found that properly fits your budget that can go off and scare any potential burglars and alert the police. Louvers are a wonderful way to protect and secure your commercial property. 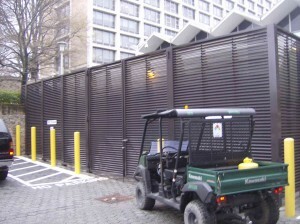 If you install louvers, it is essentially like installing a more secure form of fencing. Unlike fences, louvers are difficult to climb over and scale without falling off. Louvers also restrict vision to your commercial property, making it difficult for people simply passing by to gauge what they can or cannot do to your commercial property. They are also strong and sturdy, making it difficult for them to be broken down and into. This entry was posted on Friday, March 16th, 2018	at 4:54 pm	. You can follow any responses to this entry through the RSS 2.0 feed. Both comments and pings are currently closed.